We've been doing a lot of non-2008 Topps posts lately but that doesn't mean we're non still working hard on the set. I'm finding that posting cards from our Luis Aparicio player collection or of other things I like keep blogging more entertaining for me. That being said, next up is another signed 2008 Topps card. 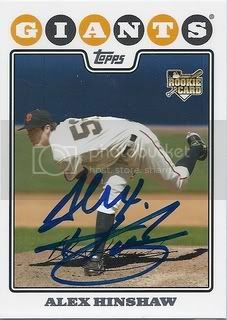 This one is of San Francisco Giants reliever, Alex Hinshaw.